The HFR Hydraulic Fixed Ratio Meter Mix Dispense machine can delivery high flow rates of high viscosity 2 component silicones, polyurethanes, and epoxies. Fed directly from high pressure drum transfer of extrusion ram pumps. The HFR-S is a popular choice in the Solar, Wind Power, Insulated Glass , Automotive, Polyurethane Foam, and Packaging industries. Optional communication gateways make it the perfect choice for integrating with robotics or other automation. With its accuracy and repeatability, the Graco HFR lets you hit a specific ratio and volume – the first time, and every time. You reduce scrap and rework with accurate, on-ratio dispensing. The ExactaBlend AGP (Advanced Glazing Proportioner) provides on-ratio dispensing of 2 component sealants and adhesives for curtainwall, insulating glass and other applications. The variable ratio ExactaBlend AGP offers advanced technologies at an affordable price. Easy to operate Compared to traditional proportioners with mechanical linkage and rocker arms, the system’s electronic controls take the guesswork out of setting the ratio. UniXact is the ONLY end-to-end automated fluid dispense system - utilizing all Graco products, XYZ motion and Graco proprietary software. 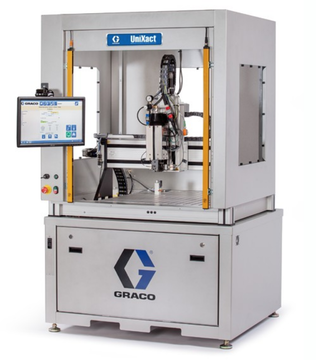 UniXact delivers precise automated dispense of many fluid types – specializing in tough-to-handle materials such as thermal interface and two component. The PD44 Micro Shot Meter Mix Dispense Valve is specifically designed to dispense small amounts of water thin to paste viscosity materials from 0.005 cc's to 5 cc's. 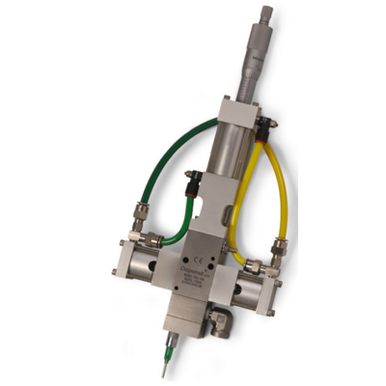 This highly precise rod style positive displacement metering valve provides extremely repeatable shot and ratio accuracy for applications requiring finite and fractional deposits of mixed material. Suitable for two component epoxies, polyurethanes, silicones, and methacrylates. Uses disposable static mixers. The F4-55 and F4-5 Direct-from-drum (or pail) Meter Mix Dispense technology for LSR (Liquid Silicone Rubber) injection molding. Easy to operate PLC-controlled, closed-loop controls ensure proper mix ratios, flows and pressures into barrel screws. 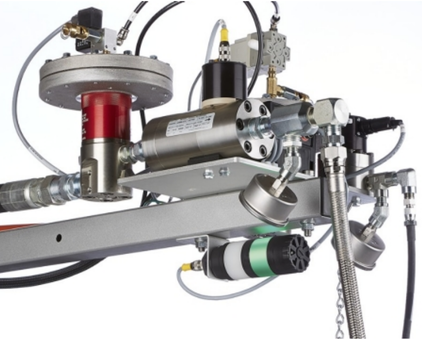 Options include multi-component additive injection kits, water-cooled LSR injection nozzles, pressure regulators, hoses along with a full range of LSR accessories and parts. The 1:1 Extruder Meter Mix Dispense technology is for highly viscous two component Epoxies, Silicones, Urethanes and Methacrylates. This unique and cost effective design, extrudes 1:1 (volumetric ratio) viscous pastes directly from 20 L pails. 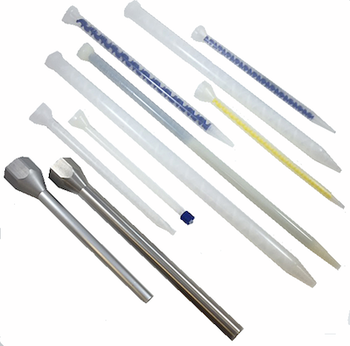 Disposable Static Mixers for thorough, air free blending of two component materials. 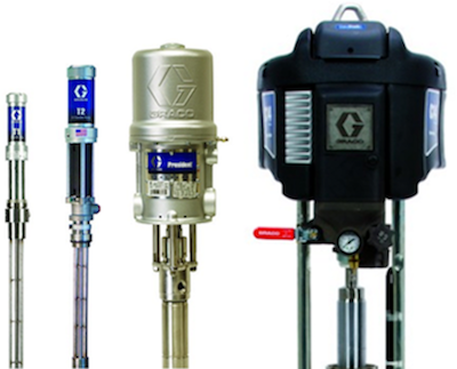 Metering and dispensing valves for applications requiring low-volume, single-component and two-component dispensing. Offers exceptional performance with a range of material viscosities – from water-thin to paste consistency. 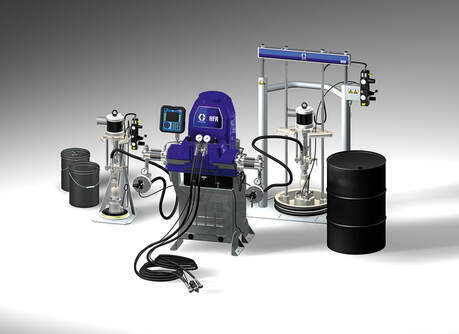 Material Transfer Systems reliably deliver one-component sealants, adhesives and other medium to high-viscosity materials from pails or drums to meter mix dispense and dispensing systems. Hydraulic Fixed Ratio Meter Mix Dispense Machine for High Flow and High Viscosity Applications. 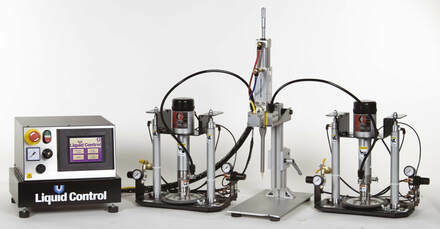 The HFR™ Metering System is a meter, mix and dispense system that processes two-component sealants and adhesives, and foams. Its modular design, and precision dispensing capabilities give you a system that is advanced and reliable, yet affordable. The ExactaBlend AGP (Advanced Glazing Proportioner) provides on-ratio dispensing of two-component sealants and adhesives for curtainwall, insulating glass and other applications. The variable ratio ExactaBlend AGP offers advanced technologies at an affordable price. PR70 Series Compact Precision Meter Mix Dispense shot and bead dispensing machine for two component materials. Designed to accurately meter, mix and dispense two-component medium- to low-viscosity materials for potting, gasketing, sealing, bonding, encapsulation and syringe filling. Volumetric ratios fro 1:1 to 24:1 depending on configuration. PosiDot PD44 two component Micro-Shot Meter Mix Dispense valve. w/ Pneumatic Micrometer shot adjustment, Hardened Tool steel precision A & B meters, wiring harness, Fits standard Bell Mouth mixers. Shipped with 10 mixers, Ratio Check adapter nut & night cap.Designed for applications requiring highly repeatable dispense volumes. Shots from 0.005 cc's up to 5 cc's (depending on meters selected). For use with two part Silicones, Epoxies, Methacrylates, and Urethane materials. JR3000 Series3 & 4 axes, multifunctional Desk-Top robot for work-cell or inline automation applications. Features built in ethernet (LAN), external motor control, concealed robot cable. Easy to configure, integrate and add to. 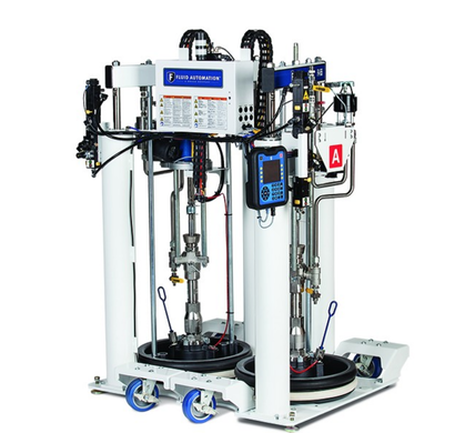 MD2 Valvefor accurate dispensing of two component epoxy, silicone, urethane, and methacrylate. Compact. Lightweight. Precise. Includes ratio check adapter, night cap, & nut. Mixers, shrouds and hoses sold separately. Drum and Stick pumps for low to medium viscosity, pourablematerials. Suitable for moisture sensitive materials. TIP POSITION ADJUSTER, FOR JR3000 SERIES DESKTOP ROBOTS. 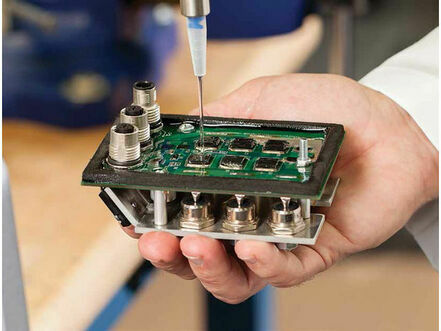 CheckMate Supply Systems with NXT Drive motors, reliably deliver single-component sealants, adhesives and other highly viscosity materials from pails or drums to a wide variety of manual or automatic dispense valves and precision metering devices.